A completely redefined user interface, with improvements on usability and accessibility, is just the more visible advantage that the new version of Plone will provide. 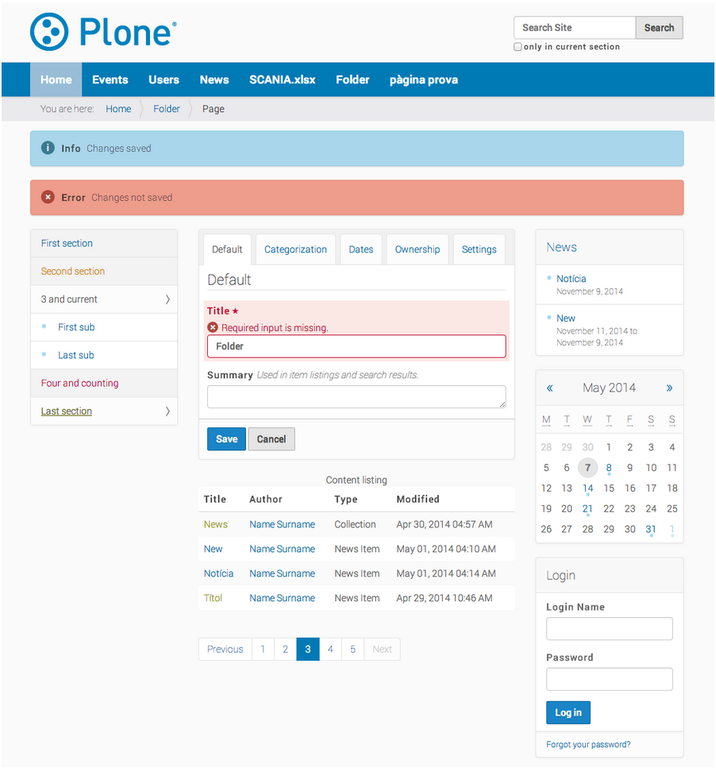 Plone 5 alpha 2 was released on April 20 2014, and most probably a stable version should be released in Autumn. A few weeks ago, the release manager Eric Steele gave a keynote on Plone 5 at Plone Symposium Midwest (in this video, from minute 14:30). Let's find out the main updates for adopting Plone 5 as soon as possible. 1. A new user interface. 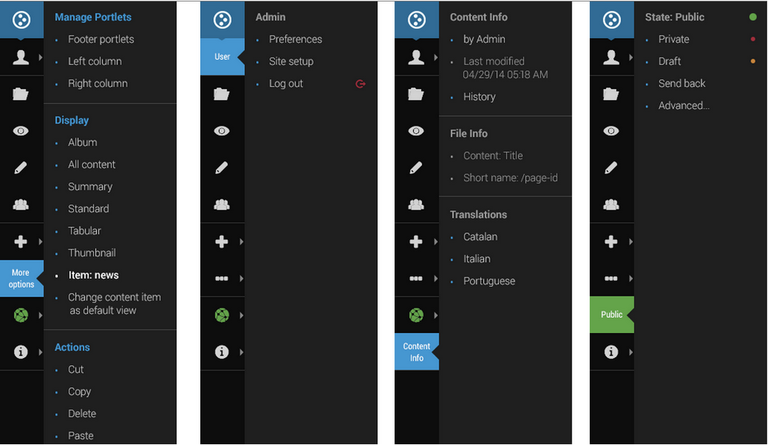 The face of Plone 5 is completely new: management UI, theme, how to customize the theme itself. The content management green bar, that is a trait of Plone since its first release, has been deeply redesigned: Plone 5 features an icon that the user can place and expand into a toolbar on the top, left, right borders of the page. This way, the editor can always get a correct presentation of the pages, with no "added" elements, while the developer will build the themes easily, without taking care of those management HTML bits. The theme has been designed from scratch: the unthemed theme is the ideal starting point for when you theme your site with Diazo. We gain many more CSS selectors, no CSS framework constraint, natural HTML5, no tables, no definition lists. Last but not least, the fresh Barceloneta theme: responsive, using LESS to build its CSS, accessible and editable TTW using the Diazo web editor. Plone is one of the best open source enterprise web CMS around, and the new release will enhance its content management features: simpler and more effective visual page editor, folder contents on steroids, Dexterity based content types with a completely new Mockup-based set of UI widgets. The last release of the TinyMCE visual editor is part of Plone 5, with a more usable UI for links and images management, an improved copy-from-word function and more effective accessibility checks (alt and title attributes validation, etc.). At the heart of Plone content management is the "contents" tab on its folder objects, that has been deeply enhanced. 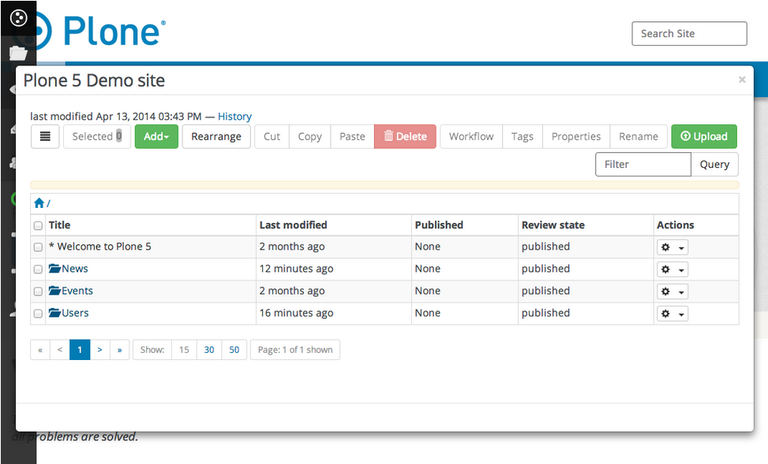 The folder_contents template in Plone 5 empowers the user to order its contents by various criteria, to quick upload multiple files and to one-click-update attributes on a batch of contents. The way of using Plone will change for many users of the former versions, for sure. Finally, all the content types in a vanilla Plone 5 instance are built with Dexterity, the content framework that replaces Archetypes since Plone 4. Besides, Plone 5 adopt Mockup, and its set of HTML widgets promise a more effective and modern interaction with Plone. Plone is well known for its robust and flexible management of users and groups. Plone 5 improves on that base: we can finally shape the user profile attributes TTW, besides the webmaster can set the whole site security policy in one clic. Not to mention all the improvements to ensure a secure protection against CSRF attacks, extendend to Plone plugins. This is very important, because you cannot call it a powerful content management system if it does not provide high security standards. It sounds strange, but Plone did not have a so called API until recently. Plone has crossed a very long evolution, rich in changes, additions and technological innovations. This has happened gradually and quite naturally, nonetheless a plethora of components used by developers makes a hard life for whom is learning Plone programming: how should I get the logged in user, or how could I move a content in a new folder? Plone 5 adopts plone.api, which answers to all the main needs of a Plone developer with a simple “from plone import api”. The use of plone.api should improve dramatically the ability to migrate Plone plugins code to the next version of Plone. Beyond this, the code is naturally more readable and easy to write. Besides, plone.api is well documented, so that it should be easily accessible to any Plone beginner around. Lately, the community did a lot to provide the best documentation ever for Plone, from the user manual to the core developer documents. The documentation on docs.plone.org refers to the version of Plone to which applies, it is now translatable, and images are built using an automatic script to easy the production of different version of the same image for both multilingual and various versions of Plone. There are more good reasons to move to Plone 5 as soon as it's available, as the new template rendering engine, Chameleon, which provides a 20% improvement in performance, or the new client side rendering of dates, which also brings in a performance improvement and the nice to have fuzzy formatting of dates (a few minutes ago, one month ago, etc.). One very useful thing in Plone 5 is the migration tool that, along the rest, provides a way to migrate all your old plone site contents to the new system, one content type at a time, with a point-and-clic UI. Keep in touch, and let's solve your doubts together!